The following article originally appeared on September 5, 2014 in the ‘In The Voices for Justice’ blog by Ignatian Solidarity Network. It can be found at http://ignatiansolidarity.net/blog/2014/09/05/jesuit-volunteer-reflects-aaa-roadside-assistance-isnt-available/ . Many thanks to Colleen Kennedy from JVC for her support and efforts in the process. Before I came here, a mentor of mine had told me to be open—to change, to the adventure, to the stories, to everything. I find consistently that being open requires a holistic effort. Often, I am challenged in my experiences physically, emotionally, mentally and spiritually. Despite the sometimes arduous task of being present, my most joy-filled moments thus far in Peru have been when I have been most opened, or to re-state Sr. Peggy O’Neill, most willing to be grasped. Whether that is jumping in a driver’s seat or sitting in a kitchen with women learning about their lives while peeling potatoes, these are the moments I will walk away from this experience remembering with fondness and fullness. Part of my experience of Ignatian Spirituality and Jesuit-informed solidarity has been to open myself to find graces in the situation at hand, or the person in front of me. It’s to practice attentive listening, which could translate to attentive openness. The moments that have been most challenging have often come from a place of being closed to my community, to my students, to my friends, or more so, to the opportunity and experience at hand. They have been when I am too busy in my head or in my loneliness to open my hands and heart to receive the joy and life that surrounds me here. It was a chilly Friday in the late afternoon, and surrounding us was a rich, golden sunlight that filled the hills of Andahuaylillas, Peru. Mycompañero, Alfredo, and I were going to Yuttu, a rural community of Andahuaylillas, for catechism classes, or better known as soccer and singing. Half way through the trip, the car broke down due to a cable that had become unplugged. The car was parked right in the middle of the road, and the driver wanted to turn the car around to roll down the hill to town. Since AAA is not yet present for roadside assistance in rural Peru, the men hopped behind the car to push and, at their request, I jumped in the driver’s seat to steer. After a five-point turn, the car was on its way to town, and Alfredo and I ascended on foot, laughing at the scene of what had just happened. On the way home, we hitch-hiked to catch the last remaining car back to Andahuaylillas: a political rally’s cattle truck. These are just examples of the testament to expect the unexpected here, as every day seems to bring silly stories. 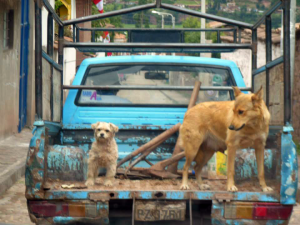 Just some dogs hanging out in the back of a truck in Anda. Living with an openness to participate in the adventure, the silly story, or the meaningful conversations further expand my heart and perspective. By no means do I say I have the secret code to doing this all the time or every day, but it has changed my understanding of myself, of my life in Andahuaylillas, and the way I hope to move in the world after my time with the Jesuit Volunteer Corps. Here’s to open hearts, willing hands, and an eagerness to let it embrace us. 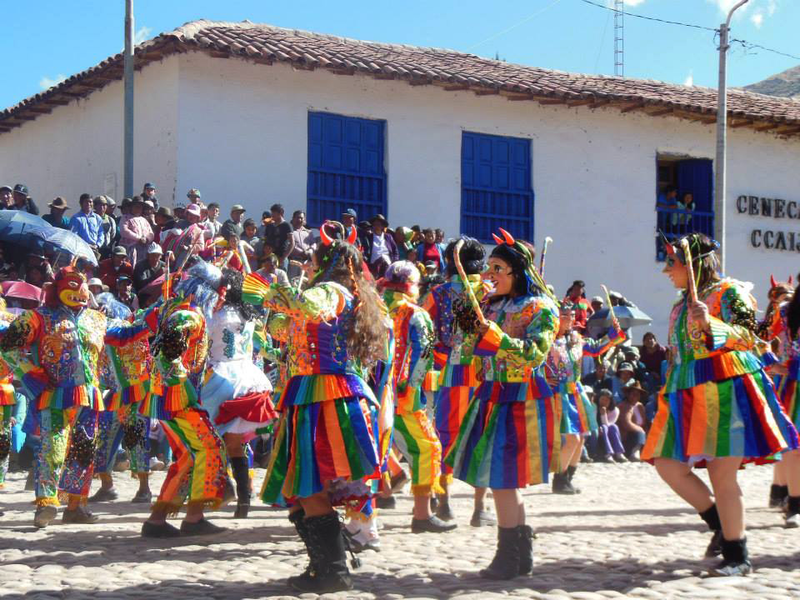 The crew from the Parish dances the Saqra, a dance about ‘little devils,’ for fiesta de San Pedro y San Pablo at the end of June. Bless me teacher, for I have sinned. It’s been almost a year since I’ve been a student in class, and two months since I’ve moved to the other side of the teacher table in front of the whiteboard. I now take back all of my comments about your sloppy hand-writing, your mis-reading of my sloppier hand-writing, and all the days my companions and I egged you on to watch a movie….I don’t get teaching fully or nearly as well as you…But I understand now a lot more. A few months ago, I started my career as a teacher. I can say confidently that teaching high-schoolers is NOT part of my vocation. Classroom management, discipline, lesson-planning, developmental psychology, patience…it’s not my forte. While I know that some of these skills will develop in the coming months and two years, there is also an inherent natural ability and passion for this that I do not possess. And, while my day-to-day complaints do not necessarily express this, I know that my role thankfully is not judged on test scores or how many folks learn about Christianity. I teach four out of the ten classes Religion in the high school at Fe y Alegría °44 (there’s two classes to each of the five grades). Now, for those of you who went to a private high school, or even a private University, and had to take Religion classes…you know that sometimes this subject is not entirely riveting nor stimulating. Talking about Church doctrine can be pretty boring on a basic level–this from the Theology and Religious Studies major. So, I can’t necessarily blame kids if they want to sleep, or flirt, or talk, or do Math homework, or throw things, or fight sometimes in my class. I also can’t blame them for the roller coaster of hormone changes their body is on, nor the lives and realities that they have at home, nor the social pressures and societal norms being forced on them at this age, nor the the basic differences and understandings of the classroom that I have from the States and they have from rural Peru. These situations just require a new level of creativity and patience on my side…like sometimes jumping up and down in class, totally acknowledging how clueless I am sometimes, and trying to tell knock-knock jokes in class. But, I’m learning that if I can just get my kids to laugh a little bit in the way that means they’re paying attention to me, or if I can get them to just start writing a little bit or imagining something different…then I feel pretty good. To be clear, they’re not all bad, nor are any of them bad in general. For example, I love it when the kids from the other classes that I don’t teach come to me asking if I could teach their class (makes me think that the gossip around Profe Jacqueline isn’t all bad as I sometimes often dramatize it to be). Or when we’re talking about vocation and listening to the call of God or our hearts or whatever and something hilarious happens…Like the time we chatted about Simon Peter fishing unsuccessfully and Jesus tells him to throw the net to the other side of the boat to catch more fish. I asked my kids, ‘What would happen if Simon Peter hadn’t listened to Jesus?’ And one shouts out, ‘He wouldn’t have eaten ceviche that night!’ And another follows up, ‘He still could have eaten arroz con leche (a typical Peruvian plate) though!’ They’re funny and creative, I just have to slowly learn to keep up with them…which will come poco a poco in time. Basically, I apologize and thank you for your patience, dear former instructor of mine. I apologize when I was in 3rd grade painting on other kids’ faces with watercolors, or for falling asleep in History of Classical Music in high school, or for never reading in any of my English classes except in college, or for turning in less-than-my-best Accounting Excel sheets or Theology papers, or for maybe using colorful language to describe you….I’m sorry. I now know that I shouldn’t have done that to make your life hell-ish at times. I also know now that you cared a lot more about me than I probably guessed or felt at times. Thanks for caring enough about me to keep me in the classroom, and for demonstrating to me that it’s not always remembering all the subjunctive rules or what the glasses in the Great Gatsby meant, but it’s about developing a holistic set of skills and learning more about myself and the world. You rock. Keep giving it your best, even when your students are a pain in the arse.